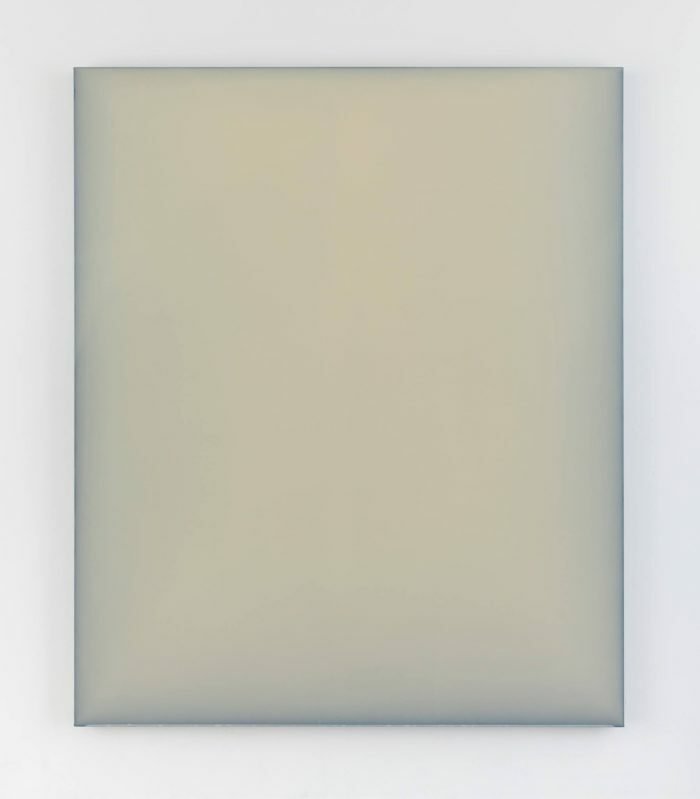 Upon entering an exhibition of Thomas Pihl’s paintings one tend to think that his work is easily understood. 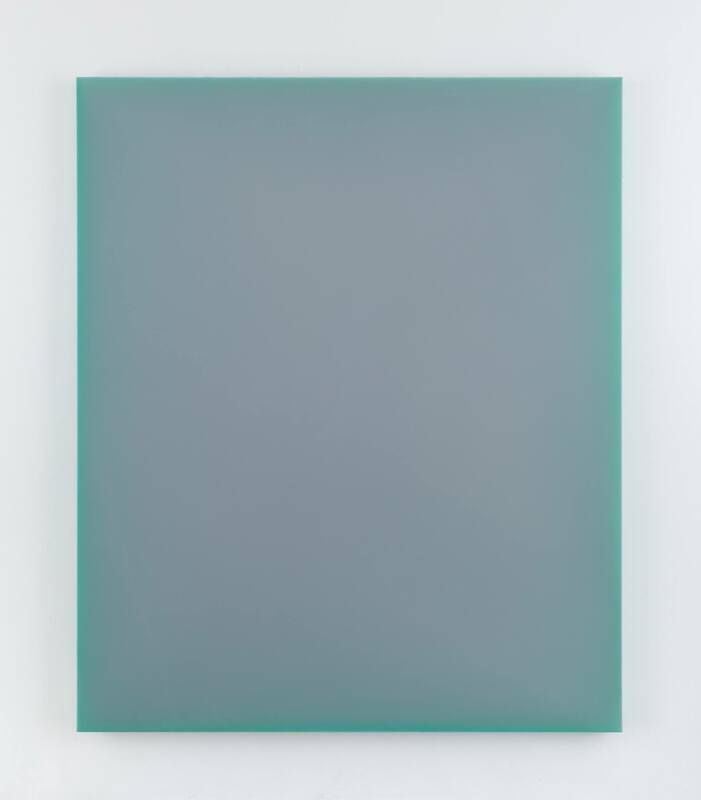 It seems steeped in the tradition of the American abstract colorfield painters and their precursors like Malevich or Albers. And superficially you are right. The billboard-sized monochrome paintings impress by the sheer strength of the color, their intensity and brilliance and the light emanating from within the painting. Their size enhance the spatial effect. However, on looking closer one recognizes that this first intuitive association does not explain all there is. It doesn’t really fit. There is the use of only one color but the overall color-theme is often if not always difficult to characterize. Pihl derives his colors by adding layer upon layer of paint. Mixing, blending till a dominant color appears. The different layers shimmer in a distance, shadows or memories of colors that were there before and now collectively form a new color. It shows when you look at the sides of the paintings where you still see drippings and jets of color that can be traced back to the final painting. The color of the painting draws you in , it lures you to look again and again. Not color as space, like in the work of Morris Louis or Ad Reinhardt, nor color as religious experience, as in the work of Barnett Newman or Mark Rothko. 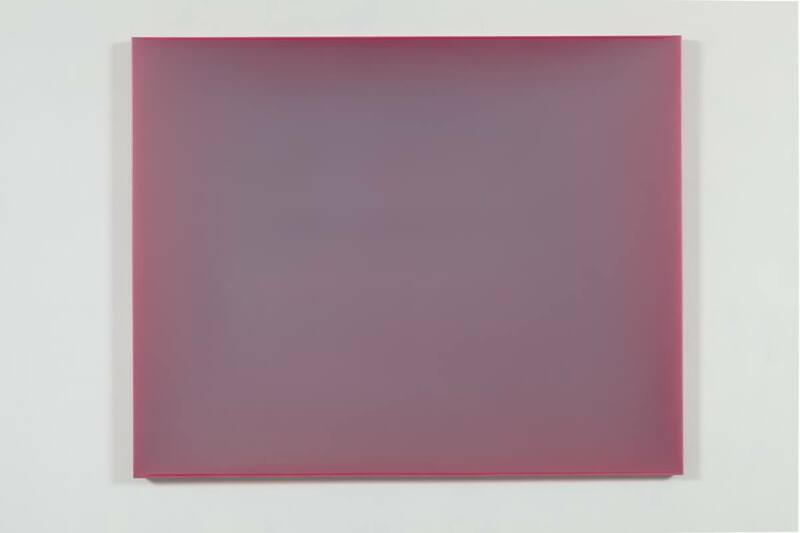 In Pihl’s work the painting itself is the center of attraction, a window to a world that is undefined but aesthetically pleasing and that refers to hidden meanings, messages from beyond the physical reality of the painting in the museum space. Not as in renaissance painting when everyday life was shown as if on the other side of the wall. The painting is an object but in itself materalises meaning, contemplation, an other world. Furthermore, though the absolute absence of any personal handwriting might be in common with some colorfiel painters, in Pihl’s case his rejection of painterly expression strengthens the impression of otherworldliness and the dominance and force of the color steer you to contemplation of pure-ness, to universal meaning in quite a different, modern way. It fits Plato’s cave, where the perfect form eludes man, who is condemned to only seeing the imperfect shadows cast on the wall opposite by the perfect original behind him. Perfection is an idea that cannot be reached or seen in our earthly world.Pihl’s work originates not in an idea of perfection but just the opposite: in the images that linger in your memory after they have been seen while walking on the street or a quick glance from the taxi in the streets of New York. His inspiration derives from the visual flotsam of contemporary popular visual culture. In his work this flotsam is transcended and condensed in moments of color. Rich, detached from its original functional meaning, captured within the frame of a painting and imbued with new meaning, a new presence after life has had its way. How does that work?In psychology one learns that, though our eyes are able to see everything around us, our mind decides what is relevant to actually register. Everything else is made redundant information. It is there but we don’t actively notice it. We create our own cave with shadows while passing life and unconsciously deciding what to see and what not to see. Pihl collects what we haven’t seen. What we have rejected. He immortalizes the ever present but hardly noticed visual information and promotes it to art using it in art’s vocabulary and giving it back as vibrant, pure color on a rectangular canvas. Like the billboards or magazines that they were derived from. A reminiscence of design.Pure color, the result of multiple layers of paint. No visible brushstrokes or gestures, not painted but poured onto the canvas. The geometrical shape universal and in measurement limited by the physique of the artist: as big as he is able to handle while pouring and controlling the canvas. The thick layers of paint hard as plastic. As plastic as the imagery of popular culture. An imagery that is treated as plastic, open to manipulation, recombination and shaping or molding. Breathing, though plastic doesn’t breath, because of the pure light that shines from within. Not pure color as in Yves Klein’s or Anisk Kapoor’s pigment works. 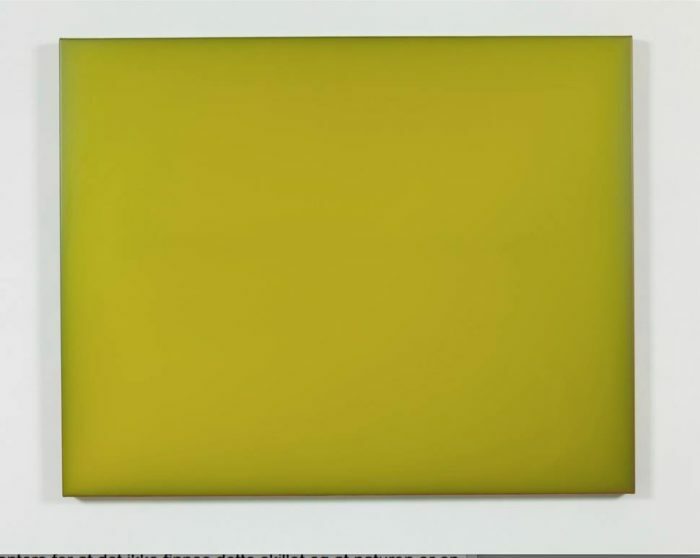 Not color derived from nature as in Wolfgang Laib’s use of bee wax and honey. But pure color derived from the multitude of posters, billboards, magazines and videoscreens that flash by while travelling through the streets of New York City where the Norwegian painter Thomas Pihl lives and works. Part of the intense city life but removed from life by art, frozen in time, ordinary reality sublimated and then released.A heart that skipped one beat, a breath taken and held for a moment too long. Sudden awareness. Pihl’s paintings are much more than monochrome colorfields. They are intense, controlled and yet so rich, vibrant and soothing. Present but not dominating, expressive but never loud, aesthetic and without obvious craftsmanship. It is as if you belong to the chosen few that sit in Plato’s cave and are allowed a glimpse of what is behind, to see a bit more than the shadows on the wall.